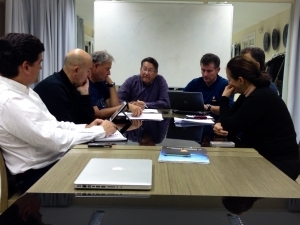 On occassion of MASTERS Event of Spearfishing, last Friday 17th of January has taken place in Palma de Mallorca the scheduled meeting of CMAS Spearfishing Commission. With presence as invited of Rafael Herrera, President of Peru Federation, as well as President and Vicepresident of Confederation, the commission took special care about last news coming from Peru as organizer of next World Championship, a delay until 15th february was agreed for CMAS to receive all required certificates from Peru Federation, for the event being confirmed. In addition, candidatures of Cadiz (Spain) were confirmed for EuroAfrican 2015 and from Greece (Syros Island) and Portugal (Sagres – Lagos) were presented for World Championship 2016. More details in coming minutes of the meeting.